Results In As Little As 3 Short Days! Reprogram Your Metabolism To Effortlessly Strip Away Stubborn Fat FASTER and EASIER Than Ever Before. 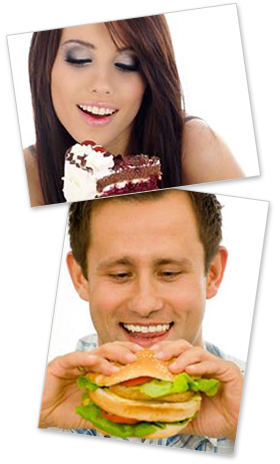 Regularly Eat Ice Cream, Devour Juicy Burgers, And Indulge In Foods That Most Other Dieters Can At Best Only Dream About! Did you know you must regularly indulge in the foods you love if you want to achieve the fastest possible fat-loss? We all love eating cheat foods. But every time we dine out at our favorite restaurant or give into food cravings we suffer the nasty consequences of storing ugly belly fat from the foods we love the most. So we feel GUILTY and FAT. However, as you’re about ready to discover, there is a strategic way to STOP this vicious cycle once and for all, while you naturally maximize your body’s most critical fat burning hormones to boost your fat loss. 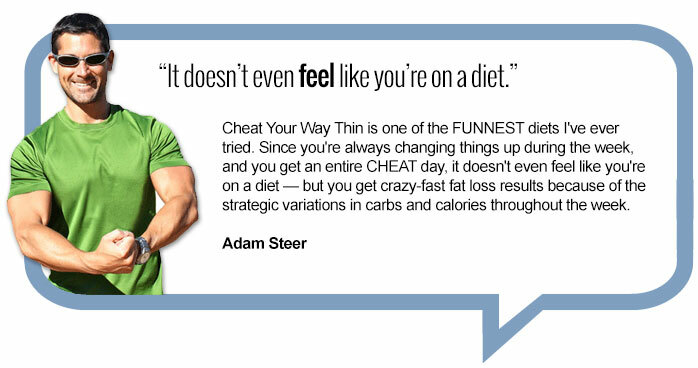 And inside this eye opening article I’m going to share how eating your favorite cheat foods can help you avoid the pitfalls associated with traditional dieting – while accelerating your fat loss like NEVER before. It’s the only cheat food system PROVEN to accelerate fat loss and you’ll NEVER find another way to use your favorite, forbidden foods for faster results anywhere else. I personally developed it, and you can only learn about it on this very page. If you’re always thinking that you’ll never keep the weight off or get a flat, attractive belly unless you avoid your favorite cheat foods, this article will show you that it is possible. Just keep reading and you’ll discover exactly how you can use this strategy on your body today, and SEE measurable results in as little as 3 days from now. Have you ever felt extremely guilty when you fell off the wagon after eating something you “shouldn’t have” when trying to diet or lose weight? But in a minute I’ll show you why intentionally eating these foods can lead to the fastest possible fat loss and make your diet fun again. So if you’re afraid of eating certain cheat foods and other high carb foods just keep reading. You’ll soon see that you’ve been lied to about the foods you’re trying to avoid and it could be STOPPING your body from burning belly fat. It takes your body about one short week of calorie restriction to substantially trigger “starvation mode” and perpetuate negative adaptations such as decreased metabolism, suppressed thyroid and leptin levels, slowed/stalled fat loss, etc. On the other hand, it takes a MUCH shorter period of time to reverse these trends via strategic practices of “overfeeding” or dietary “cheating”. 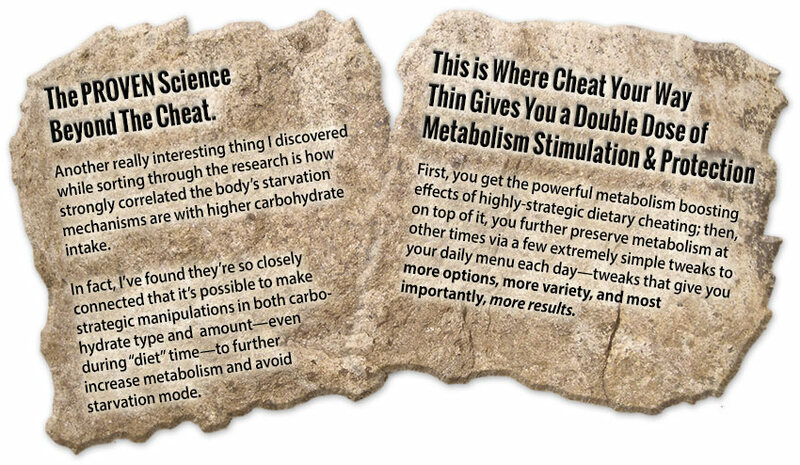 Essentially, by incorporating bursts of strategic cheating like I teach in Cheat Your Way Thin, you can literally turn your metabolism into your fat burning slave by ensuring you always have an internal environment primed for burning fat—and you do it with your favorite foods. Oh yeah, did I mention just how HUGE this is psychologically? Just think back for just a minute to the time in which our ancestors roamed the earth. You know, the hunter and gather, feast and famine type days. Unfortunately, things weren’t quite as easy for this group as they are today. NO supermarkets. NO drive-through meal deals. NO fancy restaurants. And ZERO convenience. This inevitably meant that there were plenty of instances in which our yester-year counterparts went with very little calories or food. 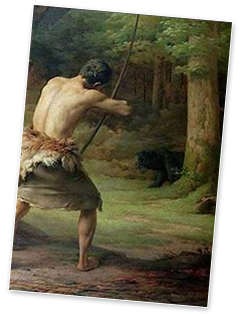 But then they would return from the hunt to feast and OVER-eat for as long as they could before they ran out to hunt for food again. And the reason why they didn’t get fat every time they went on a binge? There’s only one—HORMONES. WITHOUT cheating the body simply causes "bad" hormones, fat storage enzymes, and hunger to all increase while "good" hormones, metabolic rate, and fat burning enzymes all take a nose dive and CRASH. This means your weight loss will be stalled, your energy will be zapped, and your hormones will STOP your body from burning fat. You see, today’s dieting methods, although planned, is exactly what our ancestors did, but they ALWAYS added a feast. Go on a diet—any diet—without strategic cheat meals and it wont be long until the body begins fighting for every ounce of your body fat. You want to lose it; it wants to keep it. And guess what? It wins every time. Just think back to those feelings of guilt and failure you experienced when you fall off your diet and cheat. Now EVERY time you cheat, it will be planned. And each time you do, you’ll walk away knowing that you just accelerated your progress and kept your metabolism healthy and happy. Frankly, it doesn’t get much better than knowing that you just used your favorite dessert to speed along fat loss. Anxiety? Not any more. When cravings arise, you’ll have major comfort in knowing that you’ll be able to enjoy that very food in just a few short days when your next cheat session rolls around. Feelings of discouragement and decreased motivation? Definitely with other diets, but with Cheat Your Way Thin, you’ll actually be excited to step on the scale week after week to view the consistent, steady progress that regular, strategic cheating yields. You know, I’ve been a part of the fitness industry as a personal trainer, stubborn fat expert and best selling nutrition author for close over 15 years now. During that time, I’ve had the opportunity to write for nearly every newsstand publication you can think of, appear on more health and fitness radio shows than I can count, and I’ve even been fortunate enough to have my ideas broadcasted over the airways of some of the most prestigious television networks. I’m just like YOU—and I always have been. 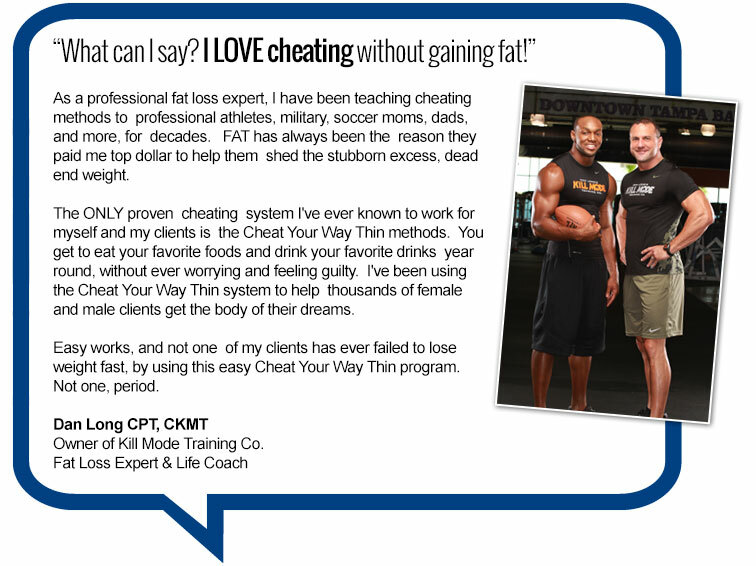 In fact, one of my most embarrassing “screw-ups” as a fitness professional just so happened to be the best mistake I ever made because it’s how I discovered strategic cheating for FASTER fat loss. I’m embarrassed to admit it. But I fell off the wagon and went on a HUGE weekend food bender when I wasn’t supposed to. Even more embarrassing – is that it was directly after making a public commitment to ALL my friends and family to lose those extra 20.5lbs I gained being consumed by life getting in the way. I remember it like it was yesterday. I was at a stand still and couldn’t get the scale to budge after two straight weeks of eating squeaky clean so I finally caved. I walk in the door to my parents house after a long day of training clients on a Friday night, and smack dab in front of me is two HUGE trays of homemade lasagna prepared by none other than, my mom. Next thing you know I’m eating plate after plate of Italian goodness—devoured. But it didn’t stop there. Since I had already “cheated” anyway, I figured I might as well enjoy the weekend and start over on Monday. So the very next day, the same scenario plays out, except this time it was a family buffet loaded with the normal cheesy potatoes, macaroni and cheese, and don’t forget about all the tasty cakes and pastries. And I didn’t bother holding back. It was GREAT. Until Monday morning, of course, when I woke up guilt-ridden feeling like a complete failure because I fell off the wagon. 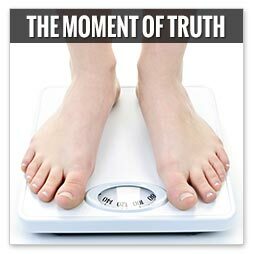 Time for the moment of truth – the Monday morning weigh-in. managed to lose three pounds. Fast forward 10 weeks and strategic cheating landed me in even better shape than when I was in high school. As you can see below, I completely reinvented the way I look by strategically cheating. 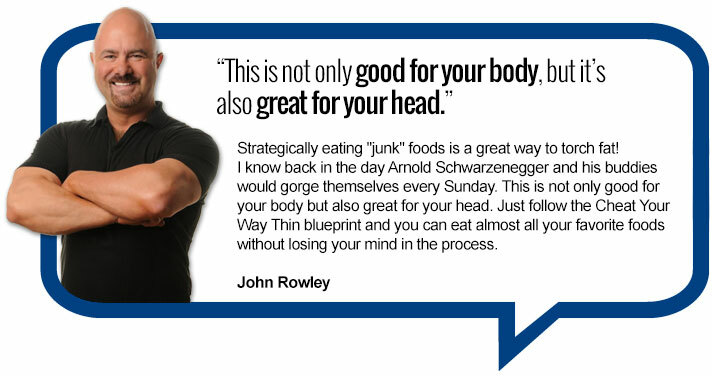 I’ve even used this cheating nutrition discovery to be "IN TIP TOP SHAPE" at the age of 41. And it doesn’t matter if you’re in your 30s, 40s, 50s, 60s, or even 70s, ANYBODY can create RAPID fat loss using these unique cheating strategies. Fact is, I’ve personally worked with hundreds—scratch that—thousands of real people all over the world with the exact approach I’m about to hand over to you today. And even more, it’s an approach that I developed and perfected through 15 years of in-the-trenches real world application and tedious research. BOTTOM LINE: I have already put in the blood, sweat, and tears into doing it all for you. But I'm also smart enough to know that pushing fat-burner pills, ridiculous crash diets, endless cardio, or even trendy 90 minute DVD home workouts are inefficient, outdated, and end up being nothing but a waste of time and energy. We ALL know better than that! ‘Dead-end Diets’—But You Have to Cheat the RIGHT Way! So you probably figured out by now that at least some portion of the diet needs to be spent in a caloric deficit for fat loss to occur—with Cheat Your Way Thin, we just make sure that portion actually “works”. That said, one of the coolest things about this program is the extremely diverse range of food choices I give you even during “diet” time. For instance, one day you may find yourself enjoying a nice flavorful NY Strip, while the next you’re taking down a plate of linguine Bolognese, beef, chicken, fish, pork and just about any other protein you can think of; fruits, veggies, and even bread, pasta, potatoes and rice are all “fair game”, just strategically timed to ensure the absolute fastest fat loss in conjunction with your scheduled “cheats”. 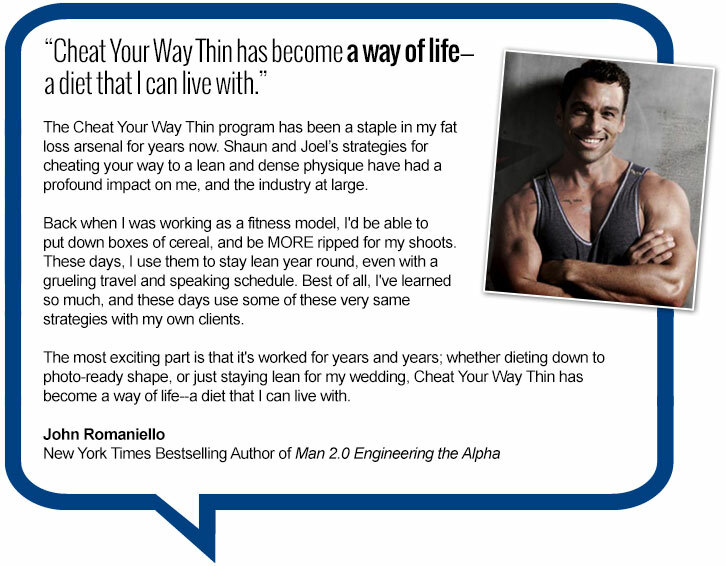 behind the Cheat Your Way Thin program. You have to be willing to take some action because it’s not a short cut or a quick fix. It’s simple. It’s strategic. And it’s unusually effective, but it’s NOT easy. We all know that “easy” does not exist when it comes to getting a flat, attractive belly. But if you’re willing to follow a SIMPLE plan and proven cheating blueprint, you too can you overcome the hormonal obstacles and diet pitfalls that stop your results. And you can make it happen with the very first phase, in as little as 3 short days. If you already eat your favorite cheat foods, guilt free, week after week, AND you’re sporting the body of your dreams…this proven cheating system is probably NOT for you. But since 97% of the population gains all or MORE of their weight back after following a traditional diet - and doesn’t have a clue that their favorite cheat foods, eaten strategically, can accelerate their fat-loss... they’ll NEVER have access to this information. It’s taken 15+ years of experimentation, a personal transformation, dozens of fitness model photo shoots, and owning a world’s TOP 10 personal training company to make this system a reality. Simply put, it’s impossible for you to get access to this proven and effective system from ANY nutritionist, personal trainer or fitness magazine. 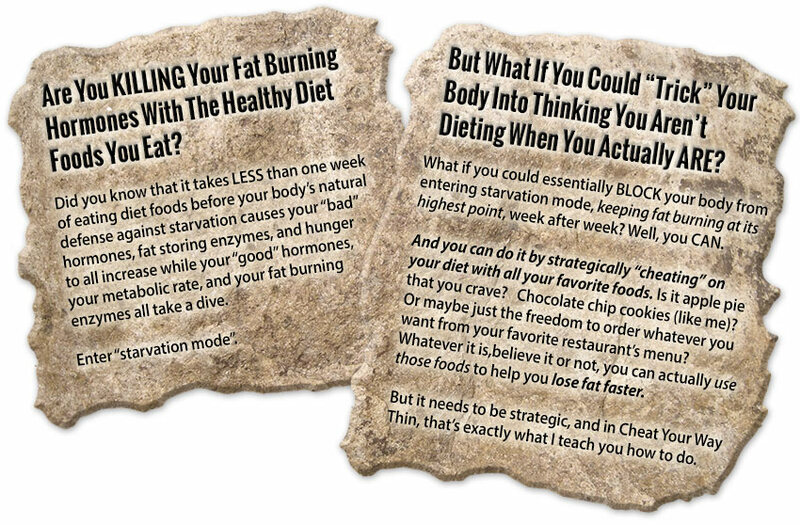 And regardless of whether or not you decide to use Cheat Your Way Thin today or not, you’ll NEVER discover how to use my proven transformation secrets (that keep me under 10% body fat year round at 42 years old), along with all the FREE bonuses I’m about ready to reveal without investing in your very own copy of the Cheat Your Way Thin Diet Manual. Well, I’m here to tell you that today it’s over. 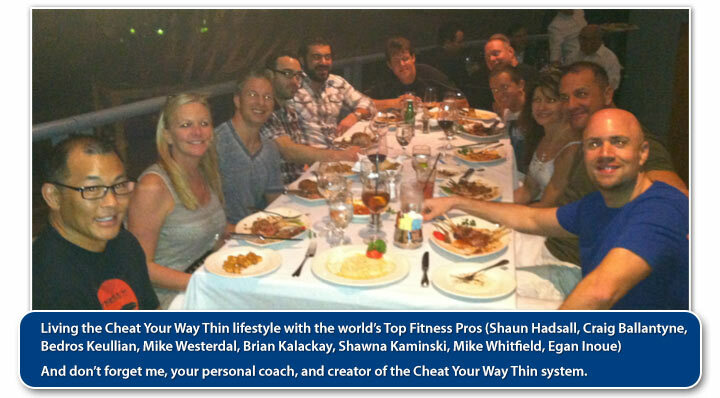 With the creation of the Cheat Your Way Thin program, “dead end” dieting is officially DEAD. So which diets qualify as a dead-end diet? Virtually ALL of them. They all restrict calories and they all eventually lead you down that same dead-end road. 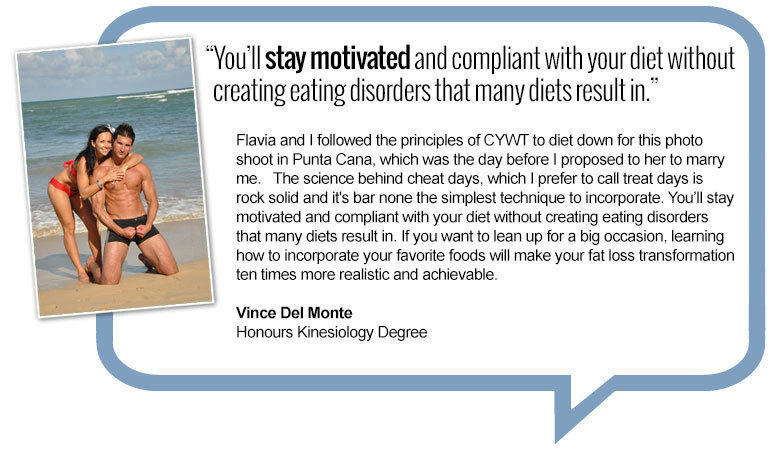 You see, the reason why you’ve struggled with these other diets is simply because they unknowingly set you up to fail. It’s not that you failed, it’s that they failed you. That, my friend, ends today. Bottom line: In order to keep your body responding to any diet you MUST regularly cheat. It’s scientifically PROVEN to fix slow fat-loss when you do it properly. And honestly, this is just the tip of the iceberg. Every nutritionist, every dietician, every personal trainer, and every diet book that gives you "traditional" dieting advice most likely has good intentions. But they’ve been unknowingly misled and lied to about these nutrition myths just like you and me. I’ve used the Cheat Your Way Thin philosophies and methods since 1998 to KEEP my stomach flat and looking young even though I’m now well into my 40s. This is what I look TODAY, not 5 or 10 years ago. The same goes for my wife Nicole. We’ve been strategically cheating together ever since we met over seven years ago and she’s a mother of three! So we can both indulge and celebrate together WITHOUT worrying about making the other person suffer. We both use the same exact strategy…just a few small tweaks and you can do the same exact thing with your spouse and friends. And this is really only the beginning. You see, almost EVERYBODY in the fitness industry uses the Cheat Your Way Thin philosophies to make dieting and losing weight a fun and enjoyable way to live. Basically, with this program I did all your science homework for you, neatly arranged it into a stylish variety-filled plan, and then supercharged it with a set-up to make certain you experience the most rapid, cutting-edge fat loss you could ever possibly imagine—all without ever having to give up a single one of your favorite foods again. It’s all strategy—delivered straight to you in simplest form. 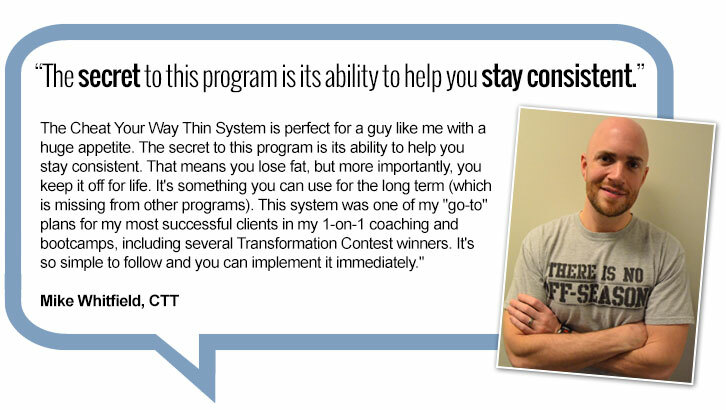 The Cheat Your Way Thin system uses 3 PROVEN PHASES. Each one is specifically designed to work together, synergistically, to help you legitimately access and burn off stubborn belly fat – All while BOOSTING your metabolism. First and foremost, you’ll be happy to know that the entire program starts off with your first Cheat Day. 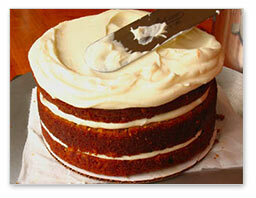 Yes, on Day 1 of the Rapid Fat Loss Priming Phase you’ll be indulging in all your favorite foods. This actually has a specific purpose: to ensure that you start the diet both psychologically satisfied and with a hormonal environment primed to burn fat. After the Cheat Day, it’s right down to business with a 19-day “primer” in which we’ll be utilizing carbohydrate manipulation to prepare your body for the strategic cheating lifestyle. The function of this phase is to prime leptin (your body’s #1 fat burning hormone) receptors to be extremely “receptive” to the set-up and weekly Cheat Days that we will be utilizing in the diet’s main phase, The Core Phase. The Priming Phase ends with another Cheat Day, then on to the Core Phase. Typical weight loss during this initial 3 week phase is 7-16 pounds of PURE fat. The Core Phase is the main phase of the Cheat Your Way Thin lifestyle, in which we will begin implementing strategic weekly Cheat Days. The length of this phase is dependant on your goals and how much weight you’d like to lose. Essentially, you’ll continue with the Core Phase until you reach your goal weight (then it’s on to the Maintenance Phase to maintain that progress!). Also, you will have five different options to choose from when setting up the weekly format of this phase based on your individual preferences. So you’ll simply customize this phase based on your personal cheat food and carbohydrate tolerance. For example, after a Saturday Cheat Day, your body will be extremely primed for fat loss. Because of this, we start the new week off with a few Low Carb days to fully take advantage of the fat burning potential of these days. Then as your #1 fat burning hormone, leptin, and your metabolic rate start to drop off mid-week, we begin to reintroduce carbohydrates and manipulate insulin to counteract the drop in fat loss hormones and enzymes. Then, a few days later when leptin dips again, we transition to even HIGHER carb days, to keep your body happy and responding. Finally, the week ends with a leptin-restoring Cheat Day and the cycle repeats. You can expect to lose, at least, 1-2 lbs of pure fat per week after week during this phase. If things are not progressing as quickly (or if you know your body does not process higher carb intake well), you’ll have four other simple options to choose from so you NEVER get bored and you NEVER plateau. Truth is, you’ll likely progress with any of the five options, but you may find one fits in best with your personality, schedule, etc. And I’ll show you exactly which one YOU should be using based on your goals and lifestyle. Once you’ve used the Priming and Core Phases to hit your goal weight, then it’s on to maintain all the wonderful progress you’ve made with the Maintenance Phase. I call this phase the Cheat Your Way Thin “Lifestyle” as it’s all about transitioning into a way of eating that you will be able to continue with for months and years to come. There are only 2 basic nutritional guidelines for the Maintenance Phase. Best of all, YOU decide which days you want to Cheat! And here’s the best part about this entire program: you are going to find that keeping the weight off is easy. Why? Simply because Cheat Your Way Thin does something that no other calorie-restrictive diet does—it protects your metabolism over the entire course of the diet to ensure that lost weight STAYS lost. Once you reach the maintenance phase it’s about three things: less structure, more flexibility, and more of your favorite foods! But What Happens When I Fall Off Track? Throughout the course of this fat loss journey they’ll be ZERO guesswork, so you’ll KNOW you’re doing everything right. You’ll keep leptin levels and your metabolism sky-high week after week. You’ll use strategic cheating and carbohydrate cycling to keep your body from “catching on” to the fact that you are dieting. You see, with other programs the complete opposite occurs. Upon completion of a traditional “diet”, your metabolism is so beaten and battered from week after week of calorie restriction that it becomes virtually impossible to keep the weight from piling back on once you resume any sort of normal eating pattern. Bad news for your past, but a bright light for your future. 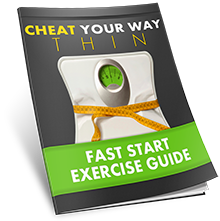 EVERY time you fall off track you just go back to the Rapid Fat Loss Primer or back to the approach that worked best for you during the Core Phase to get right back on the FAST TRACK to losing fat again. So maintaining your new, lighter weight is virtually guaranteed. Talk about a livable way to eat! Again, you remain in TOTAL control. There are FAR TOO MANY strict, complicated diets and nutrition plans out there. 99% of them are outdated, ineffective, and not realistic for everyday living. I know there are a bazillion other choices out there, so the information can be overwhelming! And it's honestly not your fault. I’ve witnessed it over and over and over again. People who aren’t patient enough to use a plan they can STICK with…so instead, they attempt another trendy crash diet and end up “harming” their metabolism. Is it any wonder why people are fatter and sicker than EVER? 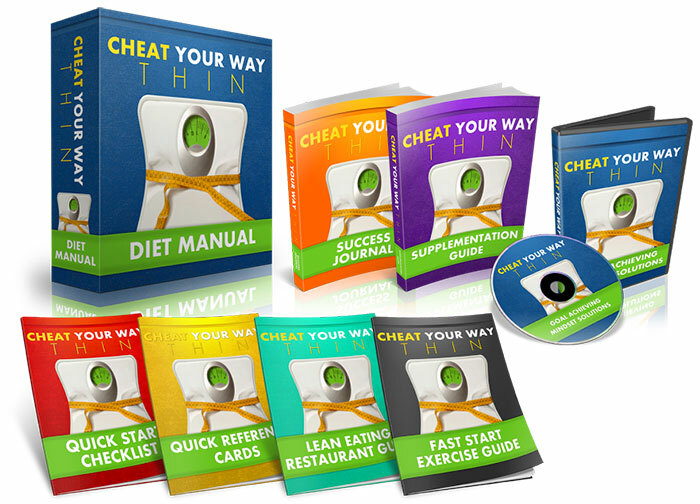 The Cheat Your Way Thin lifestyle is simple. It's time to stop wreaking and havoc on your metabolism. Stop wasting your time. Stop throwing away your money. It’s time for you to make fat loss SIMPLE again. The secret to meal timing that will keep your body continually feeding on fat stores day after day, whether you want to eat five small meals a day or eat two to three larger meals—the choice is yours. 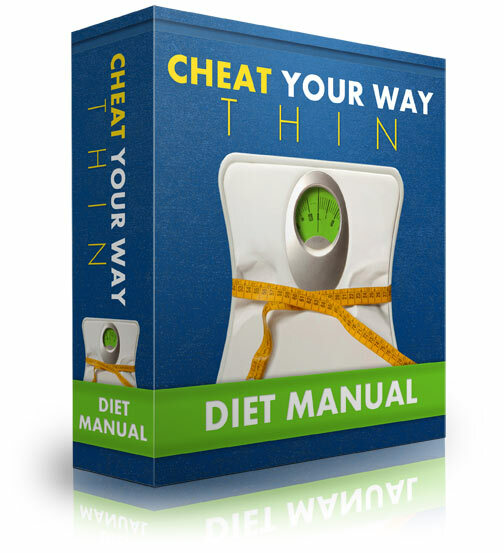 Cheat Your Way Thin Lifestyle – I simply can’t. I can’t really take all the credit because it was originally applied by professional and natural bodybuilders who have stayed lean 365 days of the year using a remarkably similar approach. And then, over time, it was tweaked and refined by nutrition experts like myself, who scoured through 73 months of real world tedious research perfecting this method. 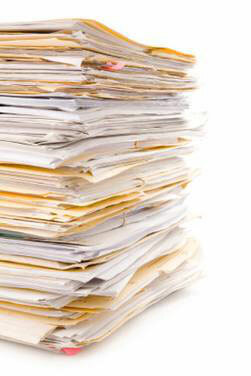 Can you just imagine going through hundreds of scientific journals and research papers detailing the most recent facts and findings about the regulation of bodyweight and metabolism? Fortunately, you’ll never have to, because some of my closest colleagues and I have already put in the blood, sweat, and tears into doing it all for you. So without the help of these world-renowned experts paving the way, NONE of this would be possible – and you would have no clue how to apply this fun way of fat-loss on your own body. As you can clearly see, these folks deserve all the credit. I’ve just been a guinea pig for the last 15+ years, and now YOU get to benefit. The world’s TOP fitness pros use Strategic Cheating to STAY lean. A method that requires some planning, of course, but a plan EVERY person can LIVE with year after year. 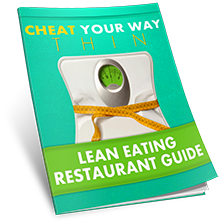 I’ve witnessed it for years with my private, paying clients – people who think they can randomly throw in a cheat meal or a cheat day without using at least ONE of the 3 proven phases of Cheat Your Way Thin. THIS is what leads to frustration. You have to set up your cheat days, strategically, to work in synergy with your lifestyle to keep your metabolism elevated and operating efficiently like we show you inside the Cheat Your Way Thin Diet Manual. NEVER forget this… it takes LESS than one week of dieting the wrong way before your kill your fat burning hormones and block your body from using fat as its primary source of fuel. Do you currently take advice from your favorite magazine, TV show, or out-of-shape personal trainer who tells you just to enjoy yourself a few days of the week and not “worry” about it? Yes, it’s simple because there are THREE SPECIFIC phases that anybody can use and follow…but it’s CRITICAL that you apply each phase based on your current condition and lifestyle for this strategy to work properly on your body. There have been many times over the course of my career where I’ve had to personally “fire” clients. It’s nothing personal, but there are certain people that will just continue to sabotage their results… and it’s just a waste of everybody’s time and money. So although the Cheat Your Way Thin System works fast, it’s not another “quick fix” or short cut. If you’re not willing to plan your week ahead of time for your strategic cheats, this system is NOT for you. Yes, it’s SUPER simple. But not if you’re too lazy to cheat the right way. If you’re not willing to “move” a little bit, Cheat Your Way Thin may not be the best fit. There are a few simple exercise rules, which require LESS than 5 hours per week that we recommend in order to greatly enhance your results. It’s nothing crazy or insane…but you’ll never see remarkable results without some type of exercise. If you refuse to follow a healthy nutrition plan for part of the week to set up your metabolism for strategic cheating, then don’t bother investing in this system. You won’t deprive yourself or be obsessed with counting calories, but you still need to follow the proven plan (so you can indulge without the guilt OR the weight gain). If you don’t believe in yourself or you think, “My metabolism is different.” I’m here to tell you…you’re wrong. 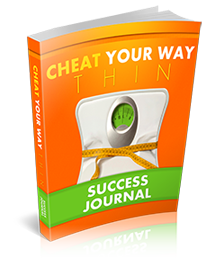 Cheat Your Way Thin works, whether you only have 10 to 20 pounds to lose…or you have 30, 40, even 50+ pounds to lose, this program WILL work – if you apply yourself and USE it. If you’re willing to follow a tried and true strategic cheating blueprint, the Cheat Your Way Thin Plan is the breath of fresh air you’ve been looking for. Sustainable results that last forever. If you’re just looking for another miracle or quick fix, please don’t bother wasting your time. Unless you’re willing to take some action, you’ll continue to accumulate more belly fat EVERY time you cheat…unless you finally decide to do something about it right now. ALL diets look easy at first. But then reality sets in. 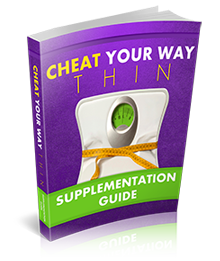 So even though the Cheat Your Way Thin Plan is a SIMPLE system that can give you the body you want…just because I said it was “simple” – doesn’t necessarily mean it’s easy. Although this Cheating Blueprint is highly effective, please do NOT be misled by the simplicity of “how” it works. Just pick the appropriate phase for your lifestyle and you’ll start seeing results in as little as 3 short days. It works for EVERY person – no matter what. The first thing I wanted to do was to make sure ANYONE and EVERYONE can use and apply strategic cheating on their own bodies WITHOUT suffering through, yet another, painful diet. So we’ve decided to keep the price unusually low for now. Plus, I pride myself on the industries BEST customer service, so once our support team has maxed out, we’ll obviously need to make some adjustments. Plus, I'm proud of the fact that I've set the standard for the Internet’s fastest customer service, so I promptly answer ALL questions. And I never want that to change. Remember, this is not some million dollar hardcover book deal. That’s why I can offer it so cheap. Thanks to digital technology, you get instant access to everything you need in one easy-to-use spot at one low price. Remember, this isn’t some two week project. I've spent the last 15+ years refining, tweaking, and perfecting this plan into one easy-to-use system. I personally charges over $500 just to sit down with a private client and go over the information inside this System, and I won’t even do a phone call for less than $150, so today's Special Discounted Price is chump change when you consider the REAL value. 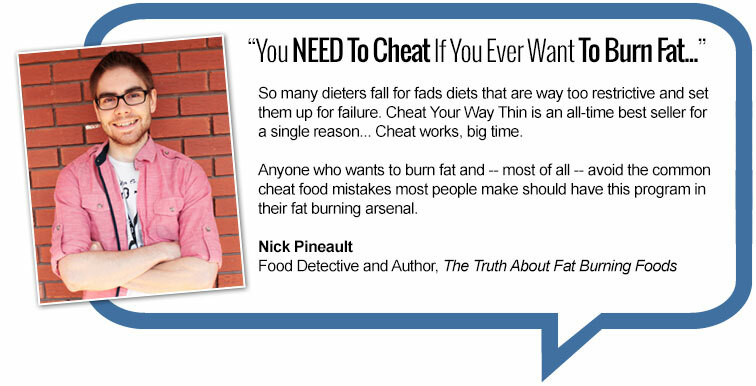 So for now I've discounted the price substantially to make sure we eliminate ANY risk or skepticism you may have about using Cheat Your Way Thin. 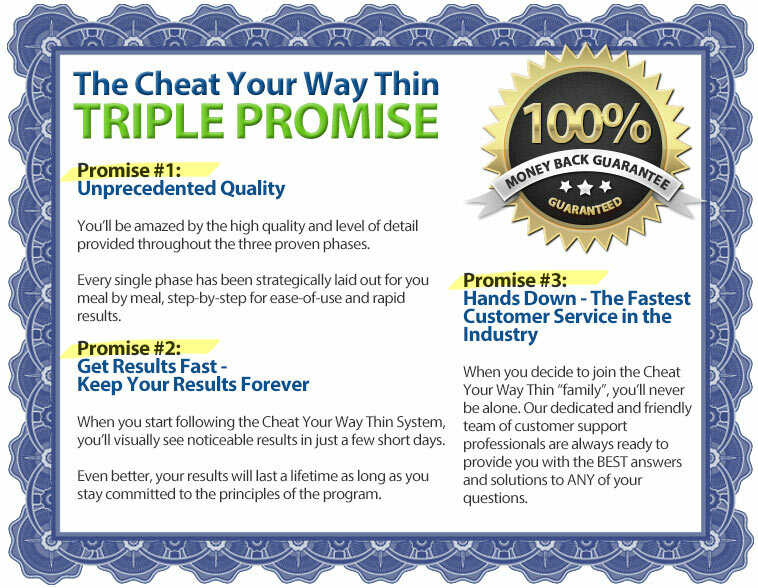 If for ANY reason at all the Cheat Your Way Thin System doesn’t live up to these three promises, just send us an email within 60 days of your purchase and we’ll give you a full, no-questions asked refund: 100% of your money back! This means you get to try all 3 proven phases of Strategic Cheating for faster fat loss with ZERO risk. AFTER you take some action…if you don’t get results, you’re fully covered. I love being generous, so I've made the decision to release the first few thousand copies for a DIRT CHEAP price. So as much as I pride myself on awesome customer service and enjoy helping our valued customers, it won’t be long before our support team is swamped. Then, I'll have no choice. I'll obviously be increasing the price. 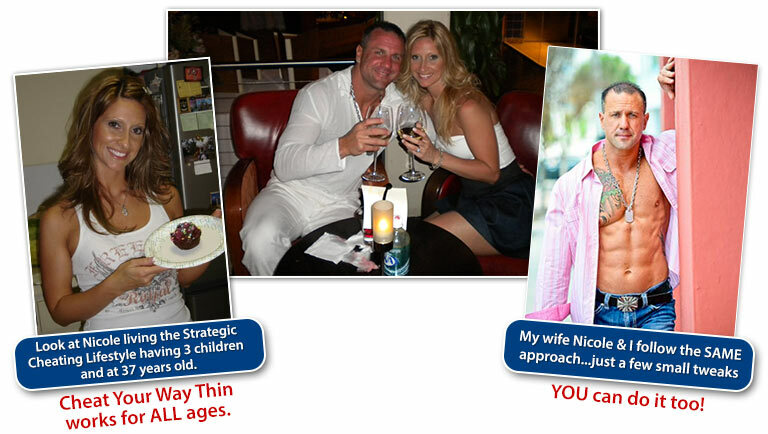 After trying so many other restrictive diets and different nutrition plans over the last 20 years, Nicole and I ALWAYS go back to the Strategic Cheating EVERY time. That’s how we know we’re giving you a safe, fast, and FUN way to burn fat. It's based on real science and it's one of the most effective nutrition systems ever developed. "What type of exercise routine should I be using when I use strategic cheating?" All these are VERY valid questions and can end be huge obstacles that STOP you from achieving your goals. In the Cheat Your Way Thin program you will find that there are several different "types" of days. 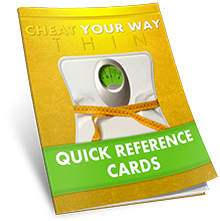 With these Ultra-Easy Quick Reference Cards, you'll never be in doubt of what to eat on each day. Complete with specific guidelines and food lists, these portable cards add yet another degree of ease to the daily flow and overall implementation of the program, for your success. Reference cards keep you confident to cheat properly. Alright, so you're just about ready to begin the program and you want to make sure you have everything lined up for success. Get excited by getting a quick and easy tutorial, from the heart of the CYWT program. From portion sizes, to how to properly cheat, it's all in here. I'm also providing you with a detailed step-by-step, itemized checklist to ensure you have everything in place leading up to your "official" first day. And just because you're amazing I've also included a secret BONUS that will accelerate your results, even faster. My gift to your NEW start. 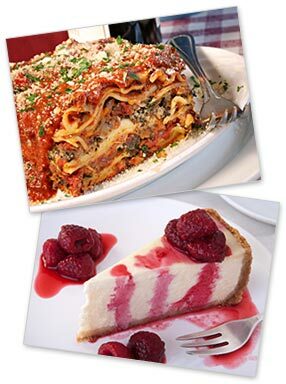 Over 75 delicious restaurants are listed in this guide, to make eating on the go, simple. 100% mobile on your phone, iPad, Tablet, or you can print these out, for your convenience. Get ready to never guess what to eat out, ever again. Drive through, dine in, or walk up to the counter, and know exactly what to order to CYWT. 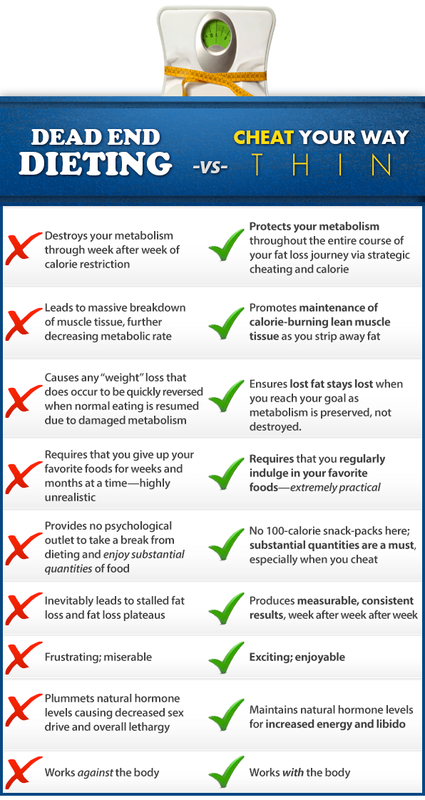 Great foods, in this easy to follow guide, will set you up for fat loss success. Eat smart every time you leave the house, with this done-for-you restaurant guide. an invaluable tool when it comes to getting the most out of your program. No more wondering what supplements to take, when to take them, or why. Although supplements are not mandatory with your CYWT program, they can give you a huge strategic advantage by speeding up your recovery, increasing your hormonal response….all while making life easier when you’re “on the go”. This easy to follow guide takes out all of the guesswork of getting faster results with proper supplementation. No hype. Just straight up facts on the best supplements to use for long term fat loss and health. No matter if you're working out in a gym, or in the comfort of your own home, this Fast-Start Exercise Guide is for you. These workouts require only 12 minutes to complete, so you can quickly get it out of the way while doubling the results of the CYWT system. Best of all, you can customize them based on your current condition with beginner, intermediate and advanced options. All three phases - the Priming, Core, and Maintenance phase, are all covered with specific workouts designed for EACH day. There is even a special workout designed for the Day AFTER your Cheat Day. You get a full 8 weeks of training with me, one on one. It's time to lose some serious fat the Cheat Your Way Thin way. Let's go. Make no mistake, planning is absolutely essential to your success, and that's exactly why I took the time to create these powerful videos packed-out with practical, actionable strategies for your immediate use. By applying the easy-to-implement strategies I openly share in these videos, I will set you up to shatter ANY goal. Make no mistake, planning and the proper mindset are essential to your success. And these powerful videos are jam packed with practical, actionable strategies for your immediate use. By applying the easy-to-implement strategies I share inside these tell-all videos, you’ll have the foundation you need to shatter ANY goal. Using the practical tips in these videos will save you time, energy, frustration, and maximize your efforts. Well, you made it this far down the page, so this is when I let it all out and tell it like it is. Here are the undeniable facts I’ve lived with and learned over the last 20 years of being passionate about health and fitness. If you keep doing exactly what you’re doing right now, you’ll most likely never find a sustainable approach to keep your body lean and healthy. In other words, your body fat will continue to haunt you. I’ve personally witnessed it. It can hinder the romance with your spouse. It can destroy your important first impressions. It can have a negative impact on the time with your kids. It can make your vacations uncomfortable. It will zap you of precious energy and we all now how it can ruin our self confidence! And it could ultimately destroy your health, lead to heart disease, or even cancer. You may not want to admit it, but it can even destroy your most precious relationships and even your career. But I don’t want ANY of these things happen to you. And I don’t want to see you end up like “everyone else” who goes through life WISHING they looked leaner and felt better about themselves. But that’s what crash diets and overeating the wrong way does. It can end up sending your body on a hormonal roller coaster and end up radically altering your metabolism. So DON’T drink the cool-aid. There is a better way to overcome the pitfalls of traditional dieting. We’ve proven it over and over again, by helping people all over the globe. Doing Exactly ONE Year Ago? 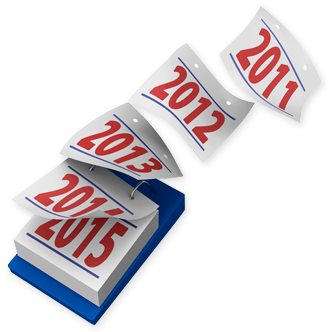 This past year went by faster than any other year in my life….and in your life. And guess what? We BOTH know that next year will go by even faster. Our life is accelerating. There's NO way we can slow it down. Ask your mom or dad how fast their lives went by. It's a blur. The older you get, the HARDER it becomes to get the body you want and the harder it becomes to burn fat and lose belly fat. It can end up being a vicious cycle but I’m here to tell you it doesn’t have to be this way. Thanks to the Cheat Your Way Thin system, you wont have to look back again next year regretting you didn’t do something different. Listen, I believe in you, but who cares if you don’t believe in yourself. By taking action you can finally have a body that makes you proud, gives you confidence and increases your self esteem. The next year is going to scream by even faster than the last. But right now you have a chance to take FULL control over your body, fit into those skinny jeans again, and live life with the body you always wanted...or you can just keep doing what you’ve always done...and keep getting what you’ve always got. Your body, your relationships, your career, your family life, your productivity levels, and even romance with your spouse will improve in ways you can’t even imagine. It’s a strange phenomenon, but when you find a legitimate way to get lean and WATCH your belly get flatter week-after-week, all of a sudden, every other area of your life gets better and better. You’ll look better, feel better, and have more energy, while improving your personal and social life in ways you could never imagine. And you’ll do it all while eating all your favorite foods 100% guilt free! P.S. – Unfortunately, action takes are far and few between. But you’ll NEVER see a change in how you look if you keep procrastinating day after day. Act now—before another year flies by. P.S.S. –Remember, you have ZERO risk. You get a full 60 days to apply the Cheat Your Way Thin lifestyle on your body. When you know you there’s a 100% money back guarantee, you have absolutely NOTHING to lose. Q: What if I’m down to the last 10, 15 or 20 pounds of stubborn fat? Will this program still work? If you look above you probably saw Nicole’s testimonial – she’s a busy mom of 3, who was already in great shape, but still managed to take her training, nutrition, and her body to the next level by using the Cheat Your Way Thin program. 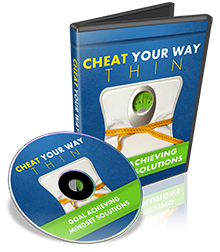 So whether your goal is to lose the last 10 stubborn pounds like Nicole, or you have 50+ pounds to lose, the Cheat Your Way Thin system will work. And it will work...fast. Q: I want to get started now; do I have to wait for you to deliver me all this information physically before I get started? Nope. This entire system will be instantly available for you to download right after your purchase. No shipping fees, no delays, no waiting to get started. 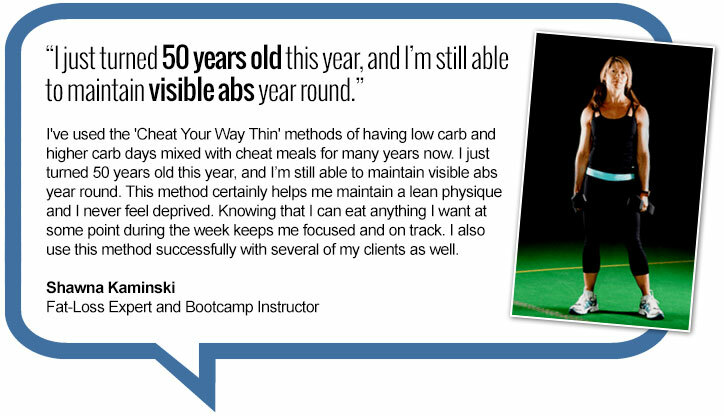 Q: I’m not a spring chicken anymore; will this program work if I’m in my 40’s, 50’s or 60’s? Of course it will. Most of our test subjects have been in their 40’s and 50’s. We’ve even had several dozen people as late as their 60’s and even 70’s use Cheat Your Way Thin to experience their own personal transformation. That’s the beauty of the CHEATING. It’s fast fat loss with a lifestyle built right in. Q: Can I use Intermittent Fasting when using the Cheat Your Way Thin? Yes, but it’s not required. Although Nicole and I are big believers in intermittent fasting, and we use it off and on as a part of our lifestyle, it’s not for everyone. But for those who are interested, there is an ENTIRE section dedicated to helping you use Intermittent Fasting with Cheat Your Way Thin. Q: What if I have a social event, dinner, etc, to attend on a day other than Saturday? Can I switch my Cheat Day? Yes, you can permanently switch your Cheat Day (which we will discuss in the next question), or you can temporarily switch it on an “as needed” basis for special events, etc. For example, let’s say that you have a birthday party to attend on a Thursday evening, but your normal Cheat Day is regularly scheduled for Saturday (a day in which you don’t really have anything planned that particular week). Do you have to tough it out Thursday (and abstain from all the goodies present) and wait it out until Saturday? You can easily change your Cheat Day to Thursday with one easy super simple switch-a-roo: just swap the two days completely. In other words, whatever you were supposed to be doing diet wise on Thursday, do that on your Cheat Day, and then move the Cheat Day to Thursday so you can enjoy the party. Naturally, this isn’t something that you’d want to do every week (it’s ideal to have consistency with your Cheat Days from week to week), but the occasional swap is A-OK.
Q: I regularly perform resistance training and use a post-workout nutrition shake. Is a post-workout shake allowed on this program? Yes, absolutely. Just substitute it for your next scheduled meal, regardless of the type of day (even if it is a low-carb day). Q: I’m still a little anxious about a full day of dietary indulgence; can’t I just have a single cheat meal? Not if you want to experience the best results. 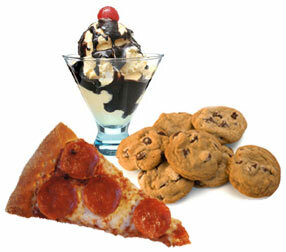 Research has proven that cheat “meals” DO NOT WORK for substantially replenishing leptin levels. For that to happen, you need a prolonged period of overfeeding (8 to 12 hours), not a single meal. Sure, cheat meals are a nice psychological outlet, but that’s where it ends. If you are looking for the physiological benefit of faster fat loss, then you need to take a leap of faith and trust me with the approach I’ve recommended here. 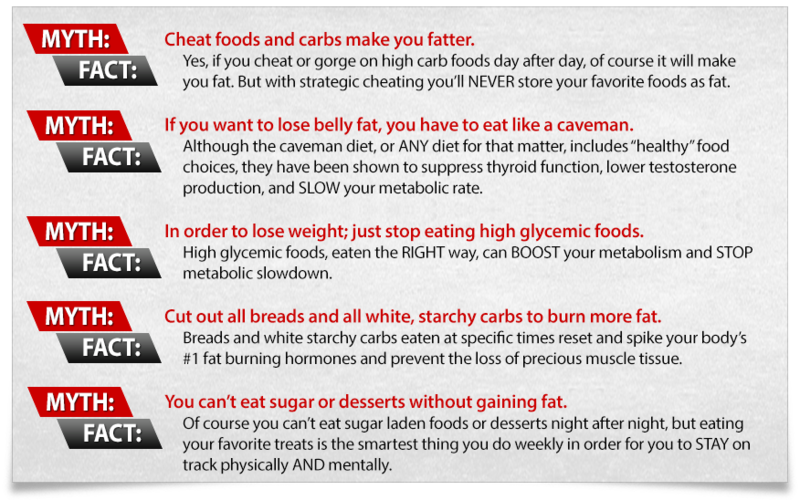 Cheat Days, not meals, prevent diet plateaus and help bring about steady, consistent, fast fat loss each and every week. Use them. Q: I’m a vegetarian/vegan; can I still do this diet? What alterations do I need to make, if any? Of course! You’ll have to get a bit creative with your food selection, however, to ensure you are getting enough protein. For meals in which you do not consume a portion of protein directly (because of the absence of meat in your diet), try adding some tofu and increasing the legume and nut content of the meal as both of these food types contain substantial protein. Please read our awesome disclaimer: Due to recent statements from the FTC, it is required that we identify what a "typical" result is. The truth: most people never do anything with the products they buy, so most of the time, their typical results are zero. The biggest factor is your ability to follow through. There is no such thing as a Magic Bullet. Your effort will determine your results.